Raymond Lester Armstrong, III (born October 5, 1965), nicknamed Trace Armstrong, is an American former college and professional football player who was a defensive end in the National Football League (NFL) for fifteen seasons from the late 1980s to the early 2000s. Armstrong played college football for Arizona State University and the University of Florida, and was recognized as an All-American. A first-round pick in the 1989 NFL Draft, he played professionally for the Chicago Bears, the Miami Dolphins and the Oakland Raiders of the NFL. Armstrong was formerly the president of the NFL players' union, and he currently works as a sports agent. As a junior starter in 1987, Armstrong had a key role in the defeat of the Oregon State Beavers, when he sacked Erik Wilhelm in the end zone for a safety that began an 11–0 surge by the Sun Devils in sealing a 30–21 win. The 1987 Sun Devils finished No. 20 in the final AP poll after defeating Air Force in the 1987 Freedom Bowl. Armstrong ended the 1987 season with fifty-one tackles (ten for a loss including a team-leading seven sacks). He was an honorable mention All-America by both the AP and UPI. As a result, Armstrong transferred to the University of Florida in Gainesville, Florida, and played his final college season for coach Galen Hall's Florida Gators football team in 1988. He was recognized as a first-team All-Southeastern Conference (SEC) selection and a first-team All-American at defensive tackle. He set a new Gators single-season record for most tackles for a loss with nineteen, including seven sacks. In all, Armstrong made fifty-nine tackles with forty-one of those solo. 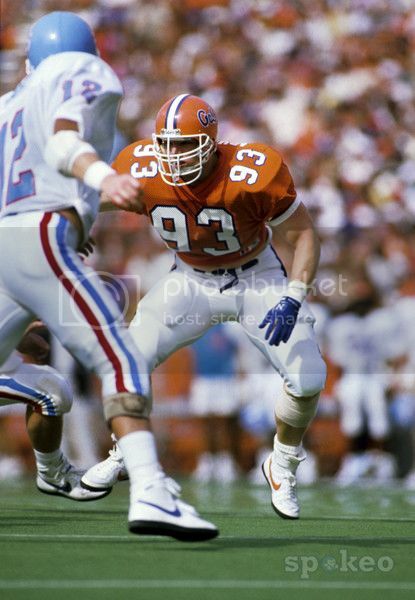 Armstrong finished his college career on the sidelines in the Gators' 14–10 win over the Illinois Fighting Illini in the All American Bowl on December 29, 1988. Armstrong underwent arthroscopic surgery to repair his left knee two weeks before the bowl game and could not play. Armstrong currently serves as the agent for former NFL head coach Marty Schottenheimer, former Michigan Wolverines head coach Brady Hoke, Green Bay Packers head coach Mike McCarthy, Tennessee head coach Butch Jones and Ohio State head coach Urban Meyer, Les Miles, Tom Herman, Dana Holgorsen, among others. He is also the agent for several broadcasters such as Peter Gammons, Chris Mortensen, Dan Le Batard, and Stugotz (John Weiner). Armstrong currently lives in his former college hometown, Gainesville, Florida, with his wife Tami and three sons. His eldest son, Jared Armstrong, is currently a quarterback for the Florida State Seminoles football team. 1 2 3 4 2012 Florida Football Media Guide, University Athletic Association, Gainesville, Florida, pp. 76, 82, 87, 89, 95, 97, 98, 101, 104, 116, 158, 176 (2012). Retrieved September 14, 2012.